Here is some of the brightest, prettiest and most unique garland you're likely to find for your holiday display. 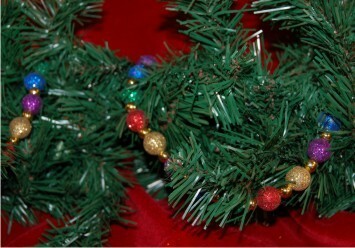 The Christmas garland with multiple colors beaded Christmas ornament looks awesome on the tree, draped around a banister or framing a window or doorway. These attractive holiday ornaments feature glittered and gleaming beads that will brighten each day of the holiday season. The multi-colored garland beads Christmas ornament arrives in our plush and pretty velvet bag, a Russell Rhodes exclusive.